The next meeting of the K&A Boaters’ Action Group will be on Monday 8th April 2019 at 7.30pm at the Black Horse, Bath Rd, Devizes SN10 2AU, by lock 48. All are welcome. 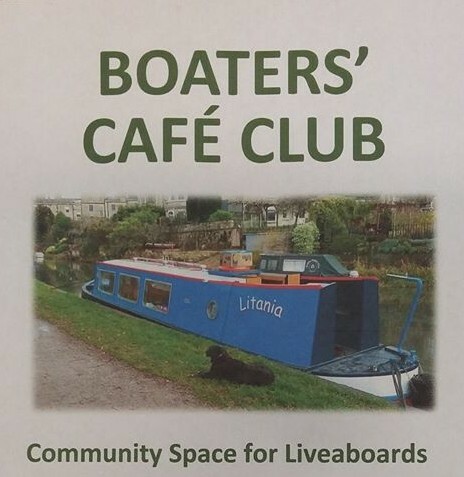 The Boaters’ Cafe Club outreach boat Litania will be at Bathampton Wharf on Tuesday 3rd April from 12 noon to 4pm. The Health Visitor for travelling communities will be on board. The Boaters’ Cafe Club outreach boat will be at Darlington Wharf in Bath next Tuesday 6th March 2018 from 12 noon to 4pm (weather permitting). The main attraction is a bicycle repair workshop where Mark, the mechanic from Julian House Community Bicycle Workshop will help and provide tools for you to fix your bike and teach you some bike repair skills. Also Claire Brown will be aboard conducting a yarn-bombing session. Liveaboard boaters and their friends on the K&A have been running a food bank to provide food for boaters and anyone in the waterway community who is in need. The Boaters’ Cafe Club outreach boat Litania will be at Bathampton Wharf next Tuesday 5th December 2017 from 12 noon to 4pm. Come and be crafty and make some colourful woolly things to yarnbomb along the canal at a later event in early spring! Clare Brown will be running the workshop, aimed at liveaboard boaters who would like support with wellbeing and mindfulness. Outreach boat at Dundas, 7th November: paper copies of CRT licence consultation and spoken word/ poetry workshop available! The Boaters’ Cafe Club outreach boat will be at Dundas basin next Tuesday 7th November 2017 from 12 noon to 4pm. The main attraction is a spoken word and poetry workshop with Dru Marland. The workshop is aimed at boaters who would like support with wellbeing and mindfulness. The loose theme of the workshop will be “outsiders”. The Boaters’ Cafe Club outreach boat Litania will be at the lower wharf in Bradford on Avon on Tuesday 5th September 2017 from 12pm to 4pm. Paper copies of the Wiltshire liveaboard boaters’ survey will be available. The Julian House Travelling Community Support Service outreach boat Litania will be at The George, Bathampton tomorrow, Tuesday 1st August 2017 from 12 noon until 4pm. There will be an Employment Support advisor on board.